The Tour De Fleece Is Here Again! It started on Saturday with the start of the Tour de France. It’s the Tour de Fleece 2016! This year I plan to spin as many different varieties of sheep wool from my stash as I can in 24 days. 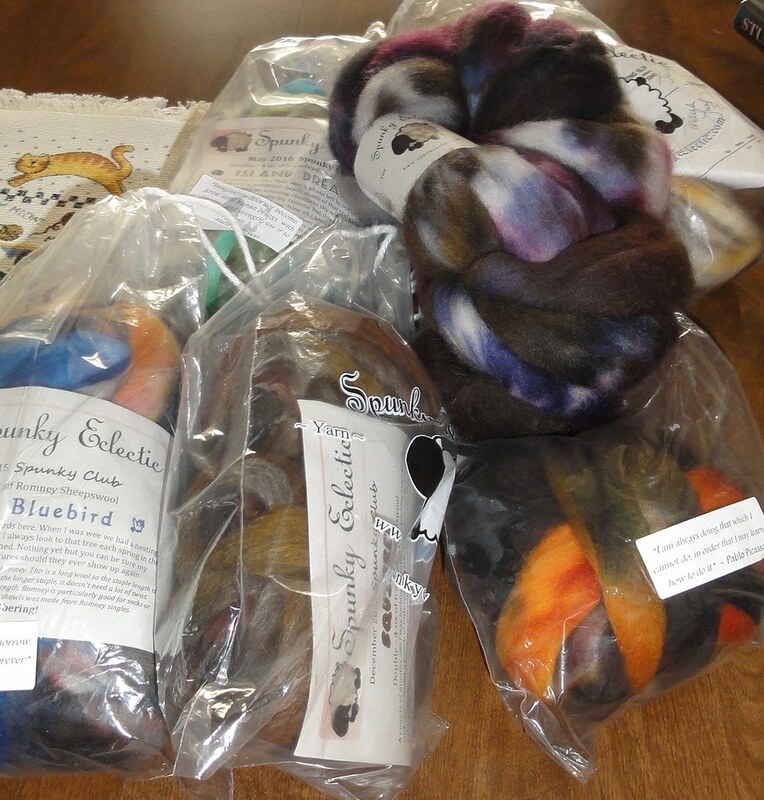 Yes, this is all fiber from my stash, and every single bit is either Spunky Eclectic or Into The Whirled. And, yes, this represents less than half of what is in my fiber stash. No, I’m neither embarrassed nor ashamed. My fiber stash is nowhere near S.A.B.L.E. These are all fibers from Into The Whirled. 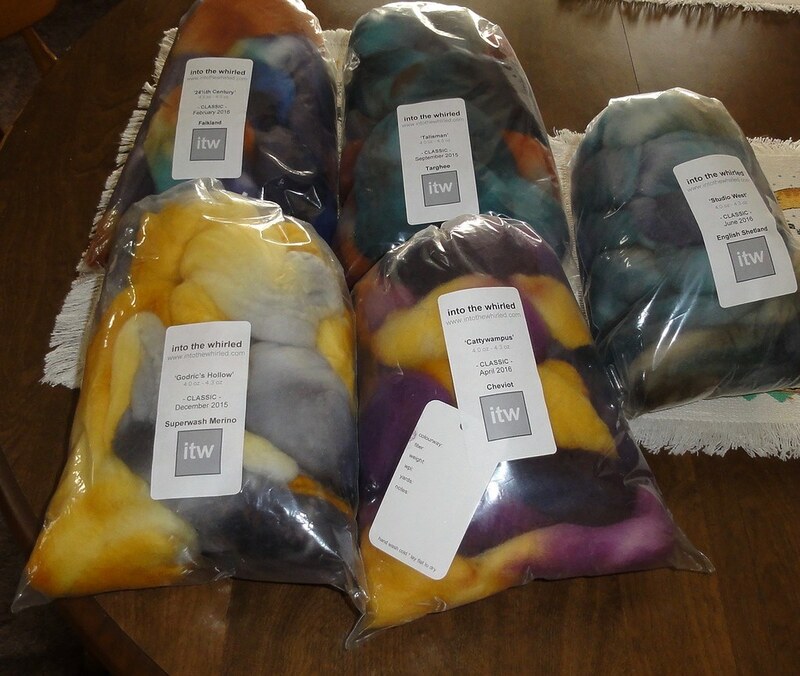 Starting at the bottom left, we have superwash Merino and Cheviot, and in the back, left to right, we have Falkland, Targhee, and English Shetland. 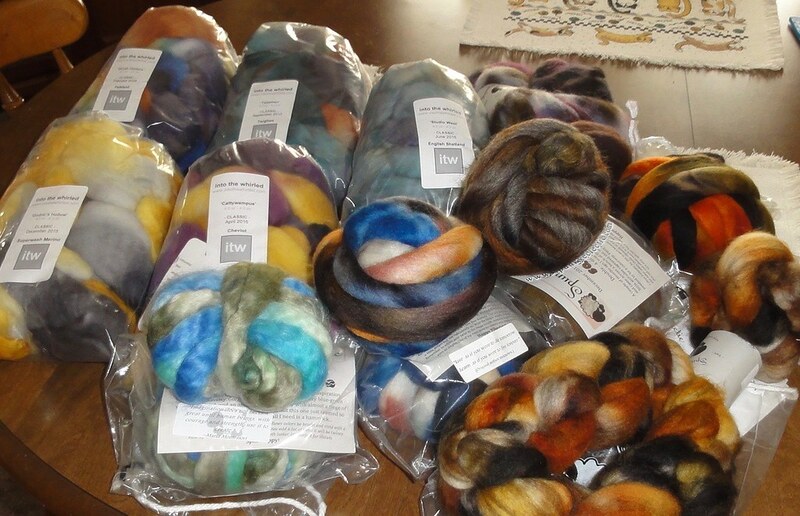 From Spunky Eclectic, there is Romney, BFL, Corriedale, Wensleydale, Manx Laoghton, and Icelandic. That’s eleven 4-ounce bumps of wool. It’s unlikely that I can spin all of that in the 12 days of the Tour de France/Fleece, but I plan to spin and ply as much of it as I can. 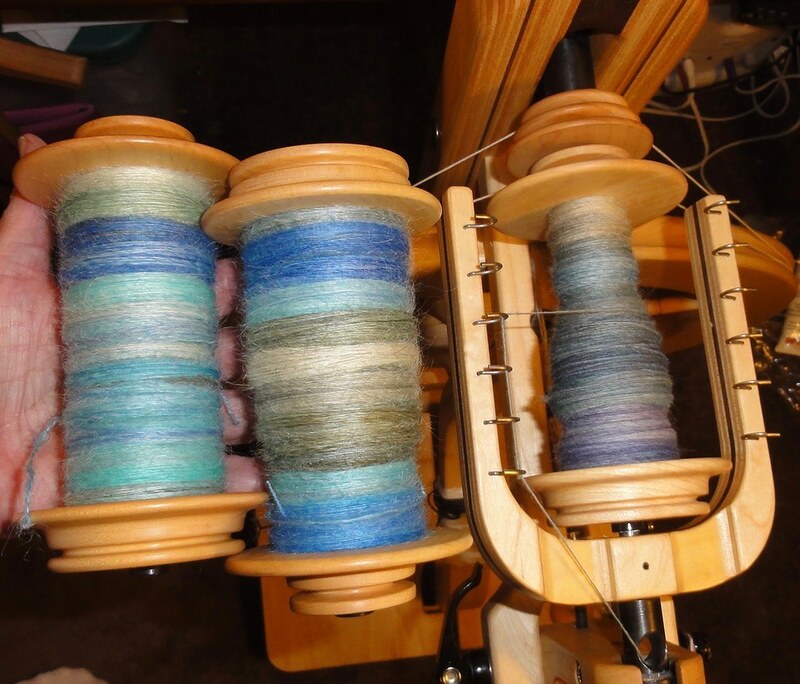 In the first two days, I’ve gotten a lot of spinning done. These singles were spun on Day 1 from Spunky Eclectic Wensleydale in Island Dreams, and I will be plying them together to make a lace weight yarn. Doesn’t Wensleydale have a lovely luster? It has a nice halo, too, but you cannot see it very well in this picture. In addition to the Wensleydale on the left–can you see the lovely halo?–I also spun part of a bump of English Shetland from ITW in a colorway called Studio West spun up. That’s a lot of spinning for Day 1. 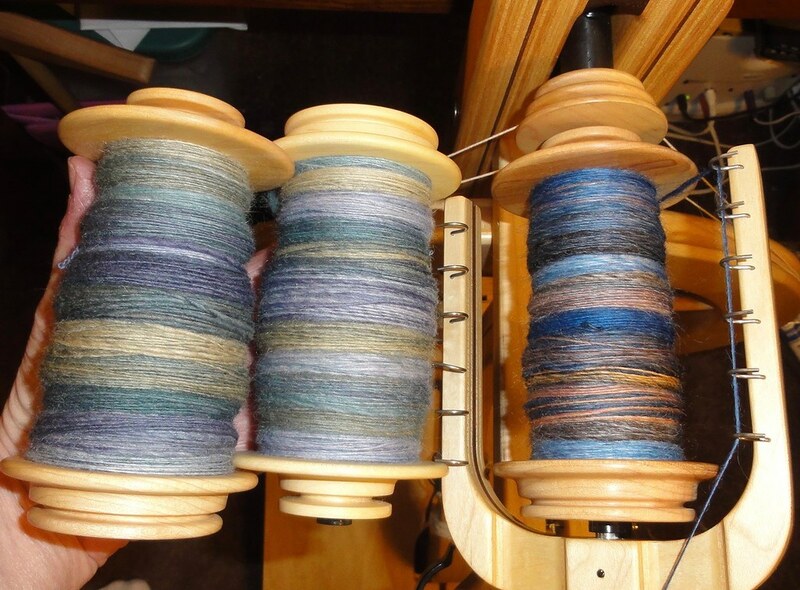 On Day 2, I finished spinning the English Shetland from ITW. I did a fractal spin, so when I ply the two singles together, I will get a 2-ply yarn with a subtle striping effect. 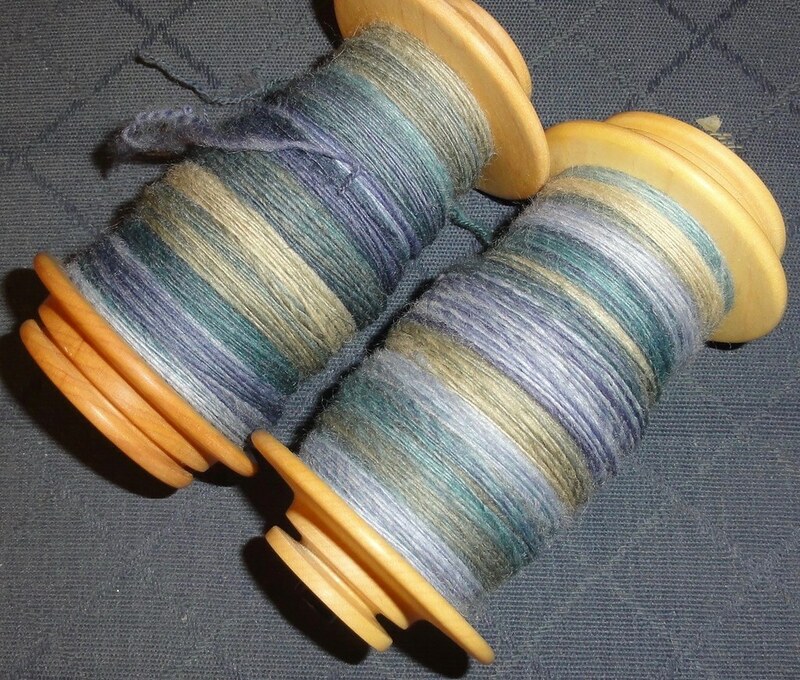 On Day 2 I also started spinning a bump of Romney from Spunky Eclectic. The colorway is Little Bluebird. For this yarn, I decided to divide the bump into 8 strips and spin two bobbins of 4 strips each. 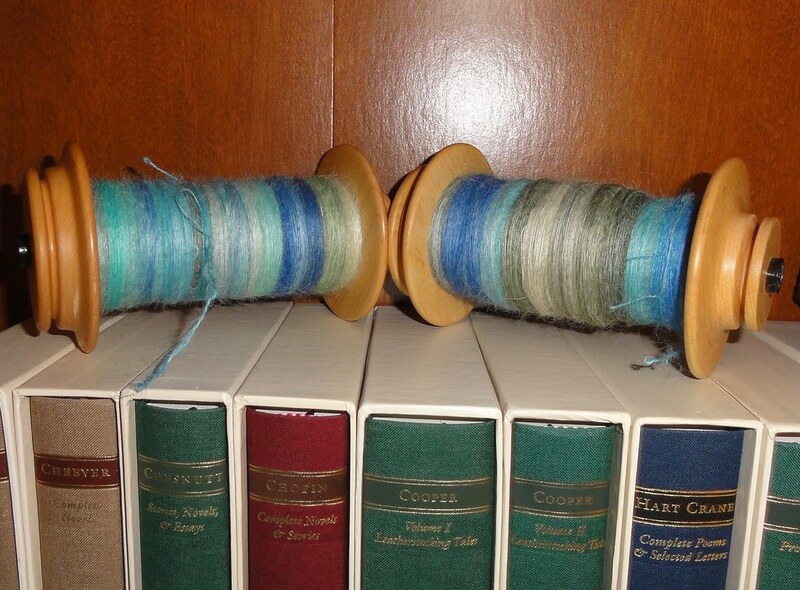 I will then ply the singles together to make a 2-ply yarn. That’s the English Shetland on the left, the Romney on the right. 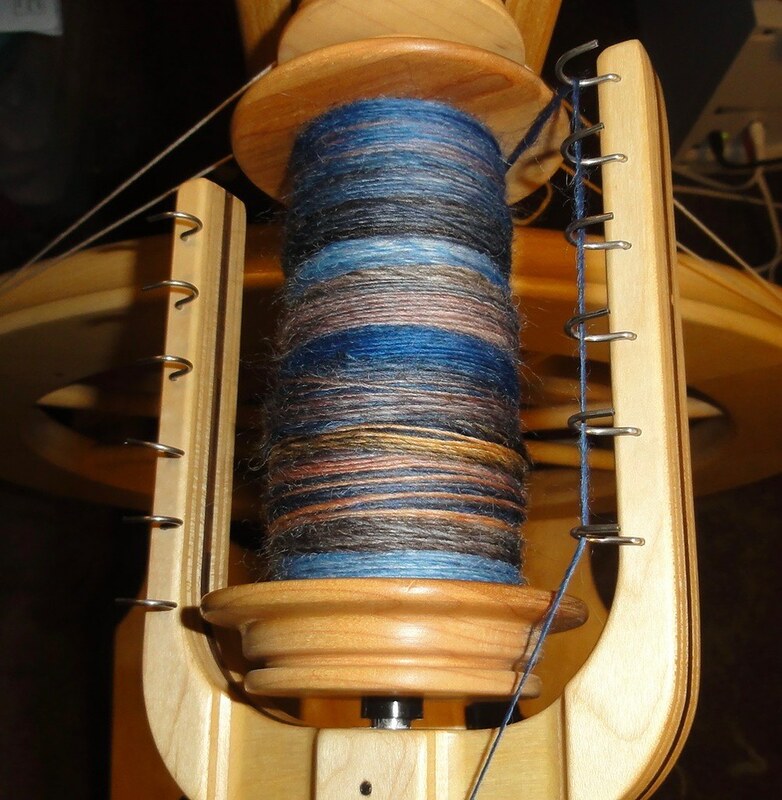 So far all of my spinning has been done on my Schacht Matchless in double drive. I will be doing the plying on my Schacht Ladybug in Scotch tension. The Tour de Fleece 2016 is moving along smoothly here in beautiful Brookline, Pittsburgh. I have enjoyed each fiber so far. I will keep yinz updated, but probably not daily because I’d rather spin than blog. Peace out! This entry was posted in Spinning and tagged Into The Whirled, Schacht Ladybug spinning wheel, Schacht Matchless, Spunky Eclectic, Tour de Fleece. Bookmark the permalink.